Sometimes manual bank transfers can be a pain, but when they’re our only payment option at an online casino we have no other choice – or do we? Australian and NZ players who can’t find a deposit method to suit them, due to fees or otherwise, other than a bank transfer will be happy to know there is a faster and easier option called POLi. POLi allows players to log in to their Internet banking, via secure POLi servers, and have all the information filled out for them in order to make a quick transaction. What’s more is it is processed much faster than a manual bank transfer, meaning you can get playing instantly. You can find POLi at nearly every online casino that supports Aussie players, but we recommend opting for only the best Internet casinos in order to experience smooth transactions, a substantial catalogue of top class titles, and a secure gaming environment. Manual bank transfers require players to get the online casino’s account information, open up their Internet banking in a separate tab, fill out the form, and finally once they have done all that wait a number of days for it to be processed. POLi sees the information filled out for you and the deposit credited to your account immediately as they alert the online casino with the receipt of the transaction straight away. It will then be deducted from your personal bank account once it has been authorised. 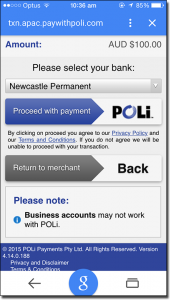 In order to make a deposit with POLi you do need Internet banking, but once that is sorted you can make a deposit with ease. Unfortunately, if your bank isn’t supported, you won’t be able to use POLi. You will be transferred to your Internet banking to log in. Remember, you are on the POLi servers, but as per the padlock in your URL toolbar indicates, your details are protected thanks the the high level of 128-bit Secure Socket Layer encryption employed by the service. The account details of the online casino you have chosen to play at will already be filled out for you, all you have to do is confirm the transaction and your funds will appear in your account instantly. PayPal is probably the world’s number one e-Wallet, but unfortunately the company has restrictions on gambling transactions. This means while you may have an account, you can’t use it to make a deposit online. That’s why POLi is a perfect alternative. It is as easy, fast, and safe as making a deposit with PayPal. Additionally, unlike PayPal, you don’t need to register an account, wait to be verified, and then link yet another payment service to fund it. Rather, all you have to do is have a participating financial institution with POLi and you can make a quick deposit. This is a big advantage over all e-Wallets including PayPal. Can I deposit using POLi on mobile? If you prefer to play on the go – on either your smartphone or tablet (devices by Apple, Android, Windows, etc) – you can make swift deposits using POLI. Follow the exact same method as directed above to deposit and you will be transferred via the mobile POLi servers, which employs the same high level of security as the desktop version. Here, you will enter your Internet banking details and tap to confirm the transaction. 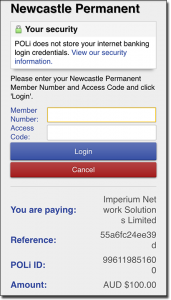 Your funds will appear in your account and can be used on both the desktop and mobile sites.